We create innovative technology solutions and provide consultancy services to clients operating across diverse market sectors including science and technology, communications, energy, and transportation. Based at Machynys Bay in Carmarthenshire and overlooking the spectacular Gower Peninsula, we are just 15 minutes from junctions 47 and 48 of the M4. We are a creative and energetic technology development business with an established background in the design and delivery of novel technology products and solutions. We have a compelling cross discipline experience plus innovative flair and enthusiasm for every new challenge. We specialise in the definition, design, development, build and delivery of new products and equipment, right from the early ideas and concepts phase through to prototype product demonstrators, product compliance and preproduction onto volume delivery. Our innovative solutions frequently combine electronics and software, optics, RF and microwave, pneumatics and hydraulics, together with the mechanical 'wrapper' to provide our clients with the next generation technology products they demand. In-house design is focused on the concepts of 'form, fit and function'. We utilise powerful 3D computer modelling tools to create early concepts and product 3D visualisations and 'photo realistic' renderings. These effectively communicate the design intent to gain valuable feedback and validate initial ideas and can help you to market and sell the product way ahead of any production. We offer a range of related services including Technical Illustration and Authoring, Website Design, Graphics Design and IT solutions. You will find more information across our website. 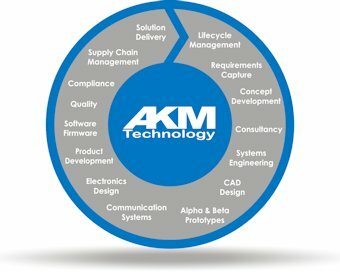 If you would like to know more about AKM Technology and the ways that we could help your business, then please get in touch by email or phone.